The Antarctic greenhouse EDEN ISS survived the polar night, as well as Antarctic storms and temperatures below minus 40 degrees Celsius. Here you can see the stairs leading to the front door. By September 2018, DLR scientist Paul Zabel had harvested 12 kilograms of kohlrabi. To date, Paul Zabel has harvested five kilograms of radish in the EDEN ISS greenhouse . Paul Zabel prepares the nutrient solution for the plants at Neumayer Station III. Paul Zabel looks into the first sunrise after the polar night. The EDEN ISS greenhouse is 400 metres away from Neumayer Station III. The thermo transport box on the sled is used to bring the salad and vegetable harvest to the Neumayer Station III. Paul Zabel at the signpost with home-made Bremen and Lübbenau signs. The Antarctic greenhouse EDEN-ISS has weathered the polar night – as well as Antarctic storms and temperatures below minus 40 degrees Celsius – in its practical test under the direction of the German Aerospace Center (Deutsches Zentrum für Luft- und Raumfahrt; DLR). 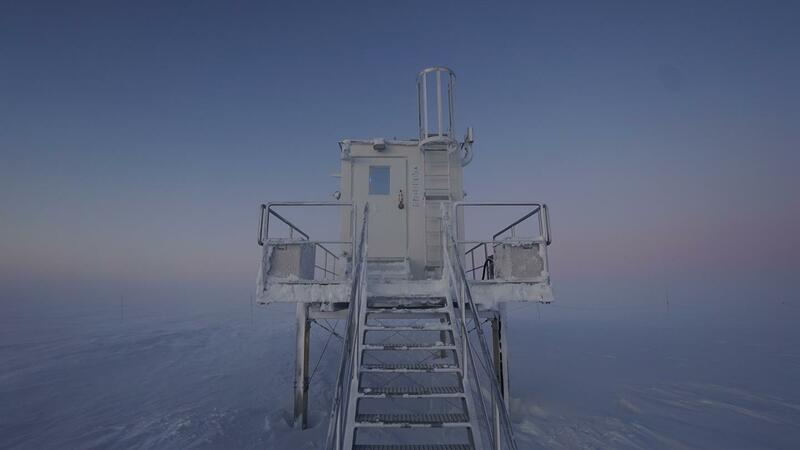 It has been yielding herbs, lettuce and freshly harvested vegetables to the 10-member overwintering crew in the Alfred Wegener Institute’s Neumayer Station III for the first time since the beginning of 2018. After more than half a year of operation in Antarctica, the self-sufficient greenhouse concept appears to be effective for climatically demanding regions on Earth, as well as for future manned missions to the Moon and Mars. DLR researcher Paul Zabel is overcoming challenges, as well as acquiring knowledge from cultivating plants under such harsh conditions. To the overwintering team, the fresh greens are a welcome change during their long-term isolation. 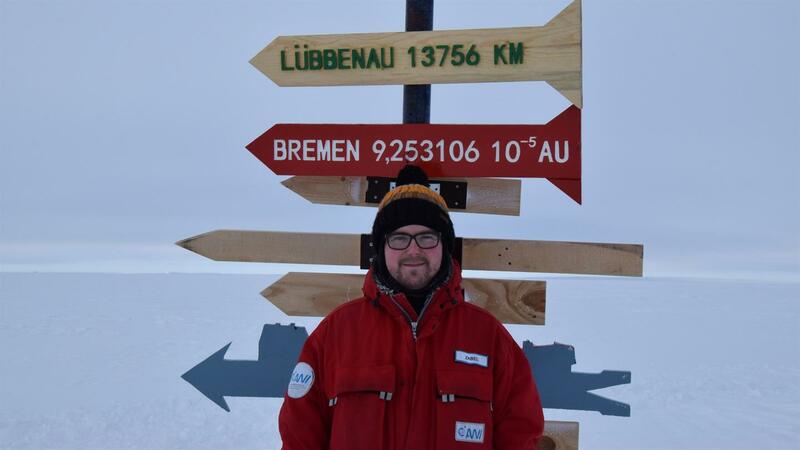 Zabel will report on his experiences in a live transmission from Antarctica on 13 September 2018. "The harvests are now so plentiful that some of it does not always make it straight to the table, and we now have the luxury of spreading out our consumption of some refrigerated lettuce and herbs over several days,” Zabel says. “The overwintering team members are always looking forward to their next fresh meal.” Indeed, the lettuce, tomatoes, cucumbers and herbs thrive especially well under the conditions of 21 degrees Celsius and 65 percent relative humidity in the greenhouse. Seventy-seven kilograms of lettuce, 51 kilograms of cucumbers, 29 kilograms of tomatoes, 12 kilograms of kohlrabi, five kilograms of radishes and nine kilograms of herbs have been grown and harvested on a cultivation area of about 13 square metres. “What astonished us was the failed harvest for peppers and strawberries,” Zabel says. The pepper and strawberry plants grow quickly in Antarctica as well, but the artificial pollination causes some problems, whereby only a few fruits or – in the case of strawberries – none at all have been produced. EDEN ISS Project Manager Daniel Schubert adds: “The pepper plants bore ample fruit during the greenhouse trial run in Bremen last year. This shows how important and instructive the greenhouse’s extreme test under Antarctic conditions is." Eberhard Kohlberg from the Alfred Wegener Institute, who is the logistics manager for the Neumayer Station III and has been a member of the overwintering crew on several occasions, says how pleasant it is to have a garden with lettuce and herbs just around the corner: “Otherwise, the menu just consists of long-life products from the freezer and storage room.” Only at the end of October 2018 will the first supply aircraft be able to provide the overwintering team with fresh food items from the outside world once again. Neumayer III station manager Bernhard Gropp adds: “"We greatly value and enjoy the fact that regularly fresh salad, herbs and vegetables from the greenhouse enrich our diet. The positive effect is noticeable.” The last part of the winter is particularly challenging for the crew, as they gradually have to switch back to normal operation with many people at the station. The EDEN-ISS project is carried out in cooperation with the Alfred Wegener Institute Helmholtz Centre for Polar and Marine Research (AWI) as part of an overwinter mission at the German Neumayer Station III in Antarctica. Many other international partners are cooperating in a research consortium under DLR’s leadership to ensure that the greenhouse in Antarctica remains functional: Wageningen University and Research (Netherlands), Airbus Defence and Space (Germany), LIQUIFER Systems Group (Austria), National Research Council (Italy), University of Guelph (Canada), EnginSoft (Italy), Thales Alenia Space Italia (Italy), AresCosmo (Italy), Heliospectra (Sweden), Limerick Institute of Technology (Ireland), Telespazio (Italy) and the University of Florida (USA). The project is financed with funds from the European research framework programme Horizon 2020 under project number 636501.